The Columbia Broadcasting System has recently dedicated their newest transmitter, for Washing­ton, D. C., thus giving the Nation's Capital one of the fifty kilowatt broadcasting stations, which is the maximum power for the United States. 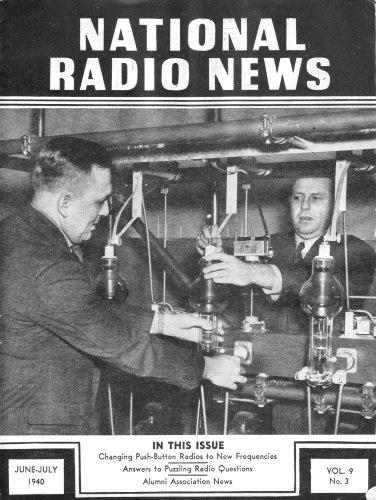 The photo on the cover of this issue of the News shows Mr. John Palmquist (WJSV's control room supervisor, at left) and William Kriz (WJSV's transmitter supervisor) demonstrating to the cameraman how simply and quickly one of the big mercury vapor rectifier tubes of the three phase full wave bridge type 200 kilowatt power rectifier unit can be replaced. This picture not only shows you how large rectifier tubes are changed in case of tube failure, but also how they are mounted in their respective positions on the rack. Of course, no one is permitted to enter the power room or section when high voltage is turned on.